Yup, that's the Apple TV main menu live in ProPresenter. Perhaps this has happened to you: You get a request from the pastor to show his iPad screen on the big screen during a service. Perhaps he wants to draw something, show some pictures or maybe even run his own slides. No matter, your challenge is to get the iPad on the screen. And probably the video for the web as well. But how? We have a few options. Perhaps the easiest option is an Apple AV adapter. They are made in both 30-pin and Lightning versions. If I were doing this, I would probably go with a Lightning to HDMI, then covert HDMI to SDI and run it back to the booth. Once it’s in SDI, we can get it into ProPresenter or the video switcher without too much trouble. Of course, you’ll need an HDMI to SDI converter, and the iPad will be cabled. That may not be convenient or cool enough. So we may have to go wireless. Well, maybe. AirPlay Display is a very cool idea. You can mirror the iPad screen or use the Apple TV as a second display for Keynote. That’s all well and good, but how do you get the Apple TV into your system? It might seem easy as it’s an HDMI connector. However, thanks to the good people at the MPAA, we have to deal with HDCP. This wonderful anti-piracy copy protection scheme not only prevents you from stealing a copy of Fast and Furious 17, but from plugging the Apple TV into a switcher. Maybe. It kind of depends on all the equipment. That’s what’s so infuriating about HDCP. You never really know if it will work until you try it. And it may stop you from getting a signal even if you’re not doing anything remotely illegal. But, we can fix it. I’m not sure why, but if HDMI is converted to DVI (or VGA) HDCP doesn’t seem to throw a fit. This is what we ended up doing this past weekend. We have a Motu HDX-SDI interface on our Mac Pro which runs ProPresenter. We actually don’t use the HDX-SDI for video normally, it was just the cheapest 8-channel AES output device I could find. It also has the benefit of being able to ingest video. After a little web research, I saw someone had success converting the HDMI output of the Apple TV to DVI, then running it through a Blackmagic DVI Extender, which turns it into SDI. I have a DVI Extender on my ProPresenter machine, so I pulled it off, and tried it. Sure enough, it worked great! The only problem is I use the DVI Extender for my main screen, so it’s not available for anything else. It was too late in the week to order another one, so I started rummaging around in our bin of old gear. I found a DVI to component video scan converter from Extron. As the HDX-SDI has analog component video in, I hooked it up. Bingo! There was a little bit of scan conversion noise, but it got filtered out by the time it hit the screen. So I left that hooked up for the weekend. If this becomes a regular thing, then I’ll probably buy a new DVI to SDI interface for ProPresenter (most likely a Matrox Convert DVI Plus) and use the DVI Extender for the Apple TV. 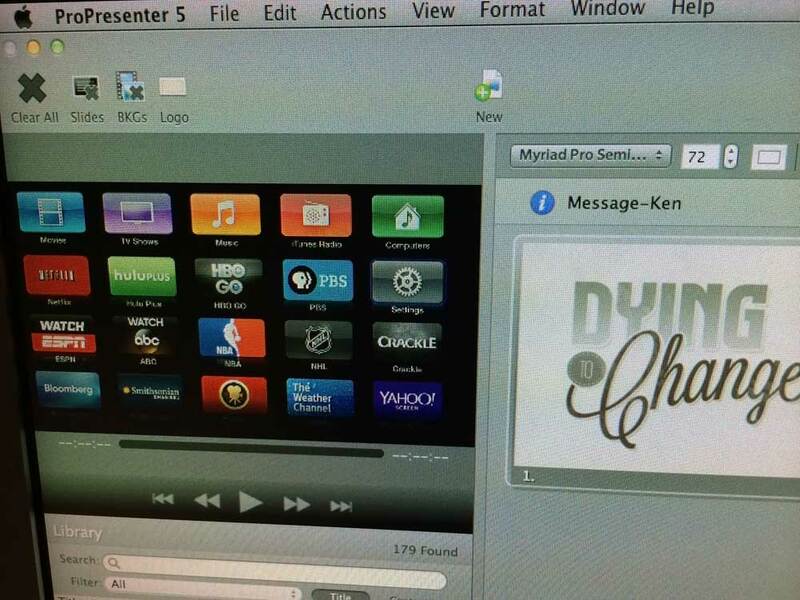 So once the video is coming in to the Mac, what do we do with it? You may not have noticed that ProPresenter has a live video option. Create a blank slide and go into the Editor. At the top, click on the Live Video icon and it drops a box on the slide. Size it to full screen and select your input. When that side goes to air, so does the video. It’s quite elegant. And since we have ProPresenter going to the video mixer, anything on the iPad will show up on the web video as well. It’s quite elegant. What if you don’t have a video interface on your ProPresenter computer, plus the DVI to video converter? Well, you could do what I was first going to do: connect the Apple TV directly to the projector and switch inputs. This has the advantage of being fairly simple and cheap. However, it doesn’t give you the ability to preview the shot before taking it live (something that scared me into coming up with the above solution), and it doesn’t get recorded. But it would work. In a pinch. We put our Apple TV on our non-public Sound network and gave it an AirPlay Display password. You don’t want some kid in the congregation jacking your Apple TV during the service. This also helps ensure the bandwidth will be there for the interface. You may also have to play around with display resolution settings for a bit to get it all working.